Heritage Cabin Rentals offers a wide variety of excellent accommodations for your next family trip to Pigeon Forge, including spacious two bedroom cabins. Our cabins have all the amenities your family needs to have a fantastic getaway! 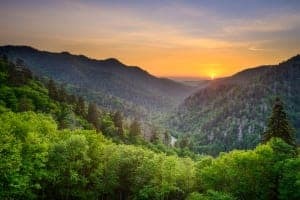 To help you make the most of your time in the Smokies, we have put together six tips for an amazing family vacation at a two bedroom Pigeon Forge cabin. Some of our two bedroom cabins come with exciting game rooms where you can challenge a family member to a game of air hockey, pool, or foosball. For a full evening of entertainment, divide your family into teams for a “parents vs. kids” tournament. To add some stakes to your competition, make the losing team do the dishes after dinner! All of our properties feature a full kitchen with every modern amenity imaginable, making it easy for you and your family to enjoy a meal together in the comfort of your cabin. Local grocery stores have all the ingredients you need to whip up a delicious dinner. In addition to the great family bonding time, eating in your cabin is a much cheaper alternative to dining out for every meal. A highlight of any stay at a two bedroom cabin with Heritage Cabin Rentals is undoubtedly the hot tub! There is no better place to relax with family members after taking a hike through the Great Smoky Mountains National Park. The jetted tub is sure to soothe your muscles and put your whole body at ease. Most of our cabins have hot tubs on the deck, so you can take in the gorgeous night sky as you enjoy the water. Our two bedroom Pigeon Forge cabin rentals come with washers and dryers that are sure to come in handy during your family vacation. After spending a day whitewater rafting, horseback riding, or go karting, there is a good chance you’ll need to do some laundry! Rather than driving into town to find a local laundromat, you can just toss your dirty clothes in the wash and relax in your cabin. Located in the foothills of the gorgeous Smoky Mountains, our two bedroom cabins are surrounded by natural beauty. Get the whole gang together to take a walk around your cabin’s property and explore the scenic area. Be sure to bring along a camera because you may come across some of the region’s spectacular wildflowers, or even spot a deer during your hike! Many of our two bedroom cabins come with internet access so guests can stay connected throughout their vacation. Having WiFi in your cabin makes it easy to find out local information such as attraction hours, admission costs, weather, and much more. In addition, you can upload your vacation pictures to social media to show your friends back home how much fun you are having in the Smokies! To start planning your vacation in a two bedroom Pigeon Forge cabin, contact Heritage Cabin Rentals today!